According to the United Nations Population Fund, more than half of the world’s population was living in towns and cities in 2008. They predict that almost 5 billion will live in cities by 2030. It is the largest urban growth period in history with Africa and Asia being the greatest centres of urban swell. Across Australia more households have chosen a “concrete change”, to live in a city apartment, as opposed to a “tree” or “sea” change. Although it might seem practical and trendy there are some serious side effects of city living such as being disconnected from nature; and the mere act of walking down a busy city street can fracture our concentration. This stands in stark contrast to the effect of walking in the quiet of parks and bush land. Increasing urbanization has psychological, social, medical and environmental costs. It even brings new environmental diseases. Some studies have shown that even momentary exposure to nature will increase brain performance and hospital patients who can view greenery from their beds recover more quickly. Because approximately 180,000 people worldwide join urban populations daily, there is not just the issue of health that is concerning, the environment is also at risk as urban “hotspots” increase energy consumption. Australian cities produce around 70 percent of our greenhouse gas output, and place added strain on infrastructure. High density construction of buildings and paving creates a phenomenon known as a “heat island”. This means that the sun’s heat is absorbed by buildings and roads raising the temperature of cities by about three degrees Celsius above surrounding areas. This makes urbanization a big challenge. However there is one simple way to improve this situation and that is by greening our city-scapes. Greening cities contributes to reducing the urban heat island effect because plants absorb heat and provide shade. The process of evapotranspiration also cools the surrounding air. Councils and governments are attempting to address community health through “greening” programs, however, although Victoria has the moniker of the Garden State, and some of the other states are not far behind, they have been well and truly outdone by some Asian and European cities. The program has been running for 40 years and roof tops and balconies alike have become an intrinsic element of the green city. 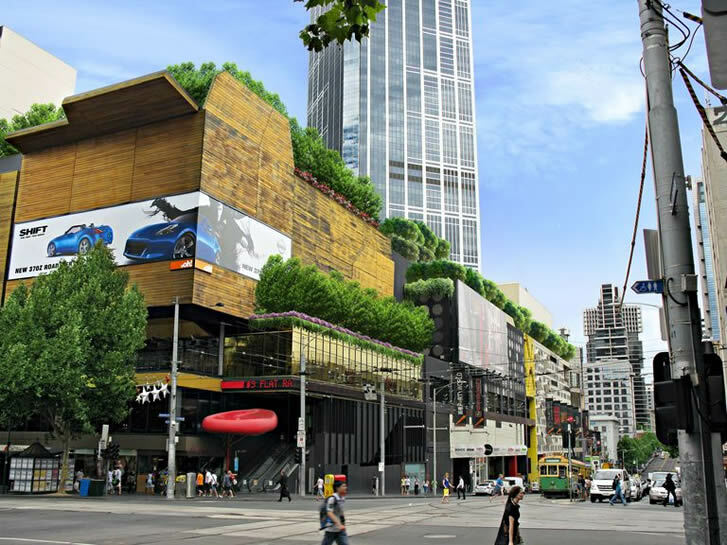 At Caulfield Krivanek Architecture we applaud the work that Melbourne City Council has done to date, however we believe that with a little effort and some creative programs, even more extraordinary transformations can occur. Add to this the sense of pride and responsibility seen in suburban community gardens and you really could have a fantastic result. Melbourne City Council has planted many Plane trees in Melbourne’s city streets, which have certainly enhanced the character of the city. A forest load of trees, in fact around 50,000 of them have been planted throughout the City of Melbourne landscape, half being natives and the rest exotics, with new parks and native plantings in Birrarung Marr, Fishermens Bend and Southbank. However there is the potential for the CBD to be greened even further and relatively cheaply. A lot can be learnt from the experience of other countries. Naturally there are physical constraints to planting shrubbery on busy, narrow retail strips. And streets such as Elizabeth, Swanston and Lonsdale have awnings and other obstructions. However Robert Caulfield says think laterally to find the solutions. In places where planting at street level is impossible, balconies, verandas and canopies can be employed for planting gardens, which beautify the buildings and have a whole host of other environmental effects such as acting as wind breaks and absorbing CO₂. Some verandas and balconies will need reinforcing prior to planting however, many could be planted out as they are. To counteract the lack of flora, Europe has a long tradition of planting under their windows to beautify their narrow urban streets. The people of ancient Rome set the standard for window box gardening as a practical solution for the poorer classes who lacked land and space to grow food, medicinal herbs and flowers. Later, these kinds of plantings became an art form when they were adopted by the wealthy classes. Colourful window boxes still enhance European cities. A striking modern day example is seen in architect Edouard Francois’ Flower Tower in Paris. The 10 storey apartment building has wraparound window-boxes filled with bamboo; an interesting feature that some may consider extreme. The traditional window box is a terrific solution in the greening arsenal for modern cities. 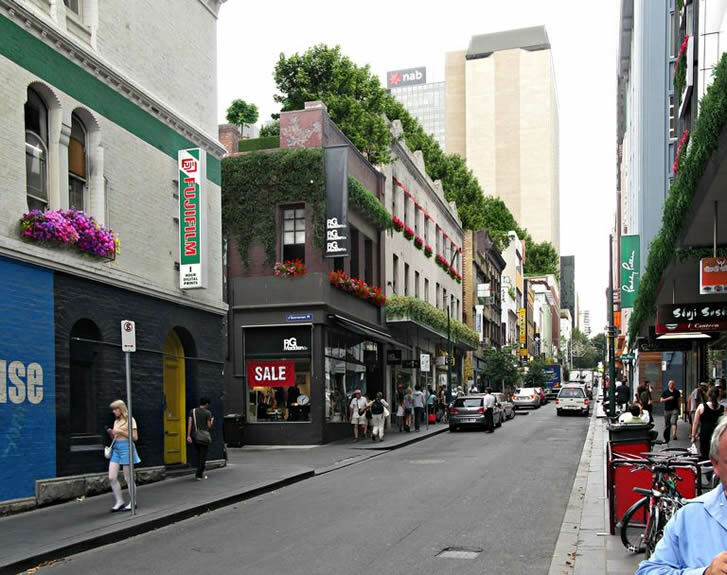 Imagine Little Bourke Street and Hardware Lane all coloured up with petunias and violets. Introducing higher level planting above street level enhances the character of large and small streets and lanes. It’s an approach seen in cities like Amsterdam, Seoul and Granada where garden boxes have been introduced to buildings. They even put planters on the street lights. It makes a remarkable difference. The attractions of living in the CBD are varied. If you work there then you don’t have to commute. Of course being surrounded by fabulous shopping, theatres and restaurants is a boon. And being suspended high above the landscape with a fantastic view of city and sea is a big plus, unless of course your gaze is over rooftops housing air conditioning units. These concrete roofs decked out with pipes and mechanical plants, could instead be covered in greenery. Roof gardens are not new. They too have been employed since ancient times. One modern example is Chicago’s 11 storey city hall roof top, which was planted up in 2000 as a part of the City’s Urban Heat Island Initiative. It was an experiment to test the benefits of green roofs and how they affect temperature and air quality. Around 20,000 plants including native prairie plants, shrubs, vines and trees grow there. A two-year study from Michigan State University, reported in October, 2009 in the US journal “Environmental Science and Technology”, calculated the carbon uptake of green roofs. The research determined that every square metre of green roof generally sequestered 375 grams of carbon dioxide a year. Translating this to the Australian urban landscape means that if green roofs were employed over Australia’s six major cities they could capture more than half a million tonnes of carbon dioxide a year from city air. Plants improve air quality by filtering airborne pollutants. They use CO₂, re-oxygenate the air and absorb harmful toxins. International studies show that roof gardens can cool the buildings under them by 3 to 11 degrees Celsius, which reduces energy use thereby cutting down on utility bills. They also provide natural noise and thermal heat insulation. Roof gardens capture and retain rain for irrigation. This reduces storm water runoff and resultant flooding in cities such as Melbourne where storm water drains have far exceeded their use by date. This was evidenced by a freak weather incident in Melbourne in March 2010 where unprecedented storm saw the CBD flooded. To maximise the benefits, a roof garden can also be a community gardening exercise involving city dwellers and workers. Community gardens are popular in many urban pockets around the world. Melbourne has many such flourishing enterprises and they provide many healthful benefits. 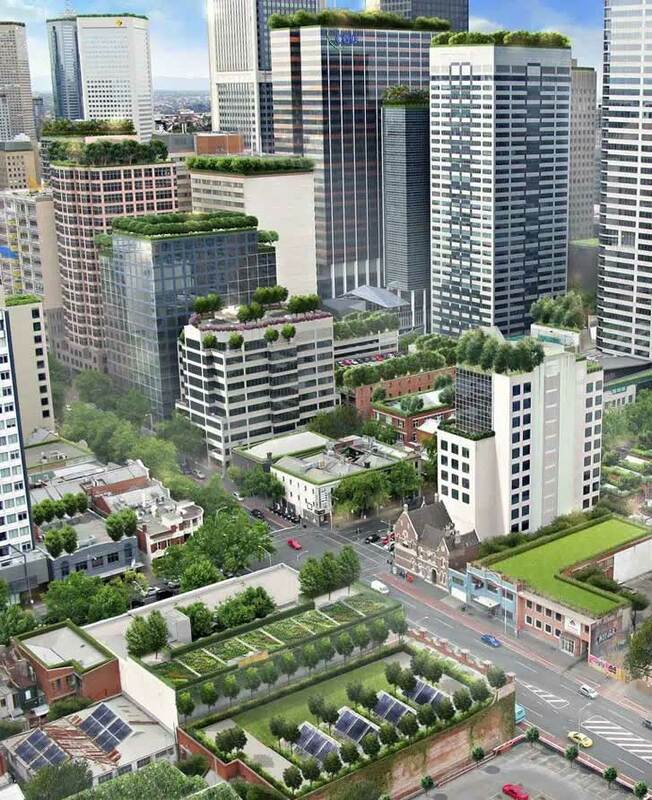 City roofs could provide the sod for home grown organic produce that was once the domain of the quarter acre block. Active community gardens can break down the isolation that some people experience living in high density environments. Overseas studies show that they also engender a spirit of pride in people’s cities and reduce vandalism. This is something that councils are well placed to run. A campaign to encourage councils, governments, building owners and tenants could transform Australian cities from stark and at times architecturally “brutal” utilitarian environments into living breathing healthy hubs of activity.